Carrie Chen opened her design studio and Casana T House next door early on a Monday morning so we could squeeze in an interview with Main Street. She showed me her weightless cashmere scarves and started up the Swiss-made espresso machine. We sampled teas and talked about her entrepreneurial career and her passion for excellence in all aspects of her life. You are involved in so much! How would you describe yourself? I’m a human being, a mother, a wife, a designer, a Buddhist. Five years ago I was living in Seattle and spending much of my time doing landscape/design projects in China and Southeast Asia. One of my daughters went to boarding school at Northfield Mount Hermon in New Hampshire, and on one of my many trips to visit her, I met my husband Stanley. I’m here because of love – of my child, of a man, and for nature. I love the beauty of the landscape here. I was born and grew up in Taiwan and went to Tunhai University majoring in fine arts. I studied abroad in Seattle, WA, fell in love with the city, and returned there to get a degree in interior design from the Art Institute of Seattle. After graduation, AGC Design Group (a large Seattle interior and environmental design, landscape architecture company) hired me. My first project was a seafood farm in Thailand designing systems for filtering water and harvesting shrimp. A college girlfriend of mine who lived in Hong Kong got me involved in some of her company’s projects in China, and eventually the two of us thought we could do this on our own. In 2002 we set up our own landscape design company doing commercial projects – primarily golf courses and resorts. China was booming and after our first two months we had 16 people working for us and grew to 68 people in two years. I love the mathematical part of landscape design and creating something in an empty space, but I do interior design in my own firm as well. So explain the cashmere scarves? I continued to have interior design clients, which led me to custom rugs in Nepal. While I was there, I visited Pushpa Basnet’s Butterfly Home, which provides children of imprisoned mothers in Nepal with an alternative to growing up in jail. I returned there with both of my young daughters to volunteer during the summer. I learned so much and I so value the contributions of the social workers. When we left they presented us with a khata scarf to spread love, which sparked my scarf idea. Through another friend I identified a socially responsible factory outside of Kathmandu, the capital of Nepal, that could manufacture and print fine cashmere. This factory has over 100 employees, mostly men, less women, and provides health care, and education for their families. Some of the young weavers have been rescued from human trafficking in Nepal and India. Here their past is protected and they are given life skills and training to start again. And they are great workers. The cashmere scarves that I create are a way of spreading love and 5% of the proceeds go to education in both the US and Nepal. Where do you sell these scarves? Is this your only retail store? The selling part is a little difficult. This is primarily a wholesale business – we sell a luxury product to specialty boutiques in the United States in places like Newport, Pacific Heights, Seattle, and the Hamptons that found us at trade shows in New York and Paris. Our largest customers are hotels and department stores in Asia. Our scarves are very sought-after at Aman Resorts International, which has 33 resorts around the world – primarily in Asia – where these fine and very light-weight scarves are perfect for air conditioning. We bought this building in Hillsdale next to the Home Chef Cook Shop in 2016. I was just looking for office space, but then we decided to add an apartment upstairs, the show room/store for the scarves, and this café. This building has great bones, but when the walls were taken down, we discovered lots of things needed fixing. It was a good thing I have a design background! We started work on it in March and opened in August of 2017. To our complete surprise we have been selling a lot of scarves at retail prices in what we thought would just be a showroom for wholesale customers. It really took off. Last year our team went to Nepal, Tibet, and Mongolia to visit the goat herders, which harvest our cashmere. In the spring the fibers are shorn from the neck and chest and then graded. Our scarves are woven from 15-micron yarn – the finest possible. While we were there we did a fashion shoot of our collection with photographer Yumiko Izu and 2016 Miss Nepal, Asmi Shrestha. Casana sounds Latino. Where did the name come from? People always wonder about that. It’s a combination of my name, Carrie, and my daughters’ names – Sabrina and Natalia. I have a strong bond with my daughters and learn so much from them. Being a mother is my best accomplishment. It’s indescribable. The one thing we taught each other is to have respect for other people, for everyone, no matter what. What is your concept for the T House and restaurant? My intent was to create a gathering place to enjoy good food and friends in a calm atmosphere. My husband loves to drink coffee so that’s why we have this amazing Swiss machine that can make any kind of coffee from a cappuccino to a double macchiato. But we also have the finest teas available. We have a limited menu with very fresh ingredients. This has become a place where people who live here like to gather. There are gifts to buy, including these teacups by internationally collected ceramist Paul Chaleff. We also have talks and the room is packed. Last spring and summer we hosted ten events. Jed Perl, who is the author of Biography of Calder, spoke. Gennie Gardiner did an exhibit based on my scarves. Kenro & Yumiko Izu gave us an incredible lecture on photography and Paul Chaleff talked about the science of clay. What is the hardest part of running a restaurant? The most difficult part is finding good staff and keeping them. It’s hard to inculcate the concept of professional service. How to put a coffee cup down on a table. How to welcome a customer. In my Asian businesses there is almost no turnover. But here after someone is hired and trained they don’t show up the next day. Maybe it’s me. I’m very precise. Everything should be carefully done. No matter what you are doing you should try to do it well, not just OK. When you clear a table don’t bang bang the plates. If you take on a task, master it. I love serving people – it brings happiness. We first started looking at a place for investment purposes, but I was specific in what I wanted. I told the realtor I wanted it to be on Main Street because I had a dream some time ago of a place in Great Barrington. The realtor showed me a building nearby that needed a lot of work. So, then, Stanley (my husband) started researching and found this location that even the realtor did not know about. From there, we contacted the seller’s realtor and when we saw the space, we were very impressed – everything was designed precisely for its purpose. The previous owner was an architect and did a beautiful job with the space. We didn’t quite know what we were doing, but the space was beautiful and intimate. Soon after, I knew that I could run this place as a bed and breakfast or we could convert the space into small condominiums for sale. I chose the first. How did you find the fabulous manager/chef? Stanley’s really good at finding good people. He put an ad on the internet, and we had about seventy applicants. Stanley reviewed the applicants and selected a handful for me to also review. But when William Merelle’s application came in, we were very impressed by his resume. He had a restaurant in West Stockbridge, MA, for 16 years called Rouge. So, we met with him and, during the meeting, I was impressed by his experience, and his ideas. I invited him to work with me over the weekend to see if it would be a good fit for both of us. I was extremely impressed by his abilities to not only run the B&B itself, but also his attention to detail. However, since he’s a chef, we also wanted to try his food. We invited a few friends and asked him to prepare a dinner for us. We were absolutely blown away by the food, the presentation, the table setting … everything was done to perfection. We knew then that we got lucky. How often do you go over there? What is different about running a hotel and a tea shop? I go almost every day except on weekends. Essentially, it’s all very similar. It’s all about having a knowledgeable staff that has a good sense of service and hospitality. The only big difference I notice is that at The Barrington people are looking for an experience that matches the comfort of their own home and beyond. It’s unlike the T House where people come in for a meal, they look at your menu, choose a few things, and after an hour or so, leave happy. But in the B&B business, guests are staying for a whole day, if not longer. I, myself, travel a lot. I understand the desire for comfort and cleanliness when travelling. So, all of our rooms are very clean because we have great housekeepers. We also have the amenities that make travelling more comfortable. For example, we have sets of luxury toiletries, terry-cloth slippers, and robes. We have late afternoon turn-down service with chocolates, and each individual room has a climate control AC/heater system that is very quiet. So, The Barrington is a home-away-from-home for the guests, whereas the T House is a quick dining experience. I have to mention, our in-house made-to-order breakfast is divine. Our guests can invite their local friends to experience the gourmet breakfast that William creates. What are your future plans for The Barrington? We plan to open our dining room to the public for dinner, as well as host events like corporate meetings, family gatherings, and weddings at our other location in Copake, NY. How important is the internet to your businesses? For my cashmere scarf business we created an internet presence immediately to tell our story and we’ve upgraded the site three times since then. E-commerce is not so important to us and maybe accounts for 10% of our sales. For cashmere customers always want to feel the quality before buying. Utilizing the power of the internet for The Barrington has made all the difference in our business. The previous owner did everything manually which resulted in lost reservations and over bookings. We found software that pulls everything together in one place from all the reservation sites on the internet. It saves so much time. What a difference! And we are redesigning the website for The Barrington which will be a big improvement. 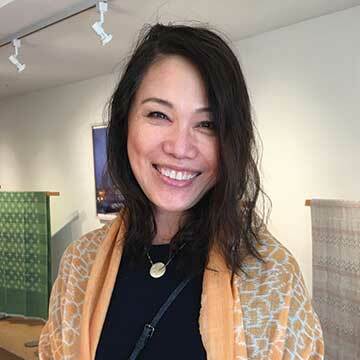 To learn more about Carrie Chen and her businesses, you can visit the following: www.casanadesigns.com, www.ccdgus.com, www.casanatea.com, or www.thebarringtongb.com.